It's not long now before 5th Cell releases Super Scibblenauts, the sequel to 2009's Scibblenauts, and in conjunction with the game's launch GameStop will be holding a special event where gamers can take part in a costume contest and even buy copies of the game ahead of its scheduled retail release. 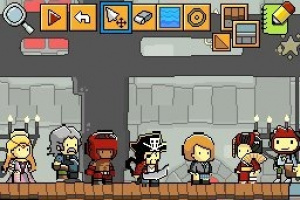 The GameStop store on Sunset and Vine in Los Angeles, California will be the venue for the Super Scribblenauts launch event on Sunday 10th October, where the game will be available for purchase from 11:00am to 2:00pm while stock lasts. As well as being the first people in the country to own Super Scribblenauts, the 5th Cell creative team will also be there for signings. This should be one event where there won't be any shortage of pens. GBA copies of the game? I want! Sigh It would be on the other side of the country. And WHAT?! I thought it was releasing on the 5th. It doesn't release until the 12th? Why does everything have to be on the West Coast??? Woo! That's (one of) my local Gamestop! Any NintendoLife people planning on being there? @zezhyrule No, he means copies of the game that are released before the nationwide release. Too bad I'm not in LA. That GameStop just asked for aq crazy day with their walls exploding. Wish I could come. LA? Ew. Although, I guess that really isn't as bad as Las Vegas or Holly Wood. This game does not excite me. Will I get the game if I type out Super Scribblenauts? @12 Hollywood is part of L.A. BUT unlike all you n00bs, i DO live in L.A. and i prolly WILL be going to the event >:3 have fun playing Super Scribblenauts on the TWELTH!!!! Hopefully this game delivers, especially in the level editor where the last game failed quite miserably (though the first game was still great aside from that). But if you do live in that area, congrats on playing this before all of us. @18 Howd u know 10/10/10/ was my birthday? Oh and i actually do live in California. Maybe Ill go to LA for my birthday, thats something ill have to think about since its on the weekend. "Why do all the cool events need to be on the other side of the WORLD to me!?!?" I can't wait for this game. It is gonna be the DS's best game to date, I think. Hopefully there'll be a Britain event too.